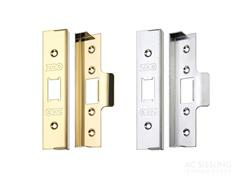 Zoo ZUKF Series flat-body mortice latch. Solid brass latch bolt. Sintered steel 8mm follower with Grip-tight feature. Short-travel latch function. Suitable for unsprung lever furniture. CE Marked 1121, Certifire approved 30/60 minutes. BS EN 12209, Grade 2. 13mm rebate conversion kit available - see related items below.